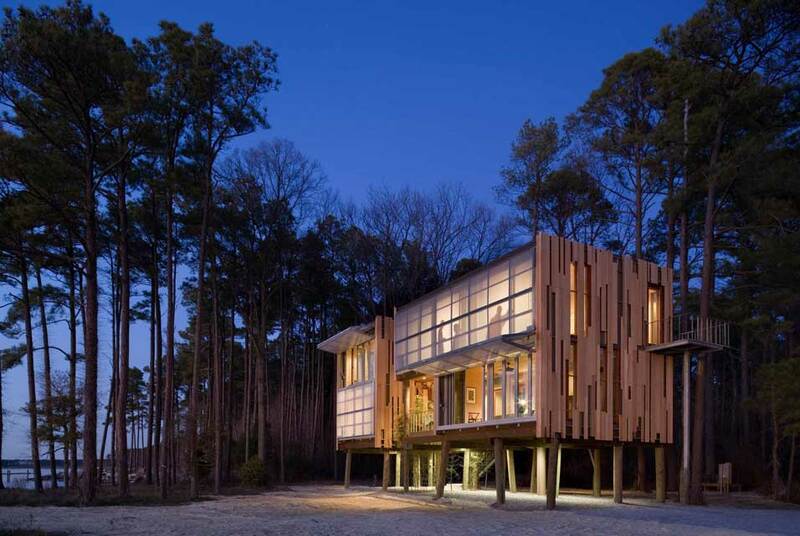 Loblolly House, Taylors Island, MD,Ê2006. Photo: Peter Aaron/ESTO. NEW YORK, NY.- The Smithsonians Cooper-Hewitt, National Design Museum will celebrate outstanding achievement in design this fall with its 11th annual National Design Awards program, now in its second decade. Today, Cooper-Hewitt Director Bill Moggridge announced the winners and finalists of the 2010 National Design Awards, which recognize excellence across a variety of disciplines. The Award recipients will be honored at a gala dinner Thursday, Oct. 14, at Cipriani 42nd Street in New York. First Lady Michelle Obama serves as the Honorary Patron for this years National Design Awards. The context in which designers and design thinkers operate is expanding all the time, as evidenced by the work of these award winners. These design pioneers are committed to shaping how we live through design and their work truly responds to the pressing issues of the day, said Moggridge. The 2010 National Design Award nominations were solicited from a committee of more than 2,500 designers, educators, journalists, cultural figures and corporate leaders from every state in the nation. Nominees must have at least seven years of experience in order to be nominated, and winners are selected based on the level of excellence, innovation and public impact of their body of work. This years jury of design leaders and educators from across the country convened by Cooper-Hewitt reviewed the nominations and chose Lifetime Achievement and Design Mind recipients, and selected winners and finalists in the Corporate and Institutional Achievement, Architecture Design, Communication Design, Fashion Design, Interaction Design, Interior Design, Landscape Design and Product Design categories. First launched at the White House in 2000 as a project of the White House Millennium Council, the National Design Awards were established to promote excellence and innovation in design. The Awards are accompanied each year by a variety of public education programs, including special events, panel discussions and workshops. Cooper-Hewitts fifth annual National Design Week will be held Oct. 9-17. The Lifetime Achievement Award, recognizing an individual who has made a long-term contribution to the practice of design, is presented to editor, designer and planner Jane Thompson. For 60 years, Thompson has explored how design relates to human well-being, urban life and the global environment. As founding editor of I.D. Magazine, Thompson became a critical voice on issues of design, also providing a strong female perspective on what was a male-dominated field. Thompson has been a principal in pioneering urban-revitalization projects, including Faneuil Hall Marketplace in Boston, Union Station in Washington, D.C., Grand Central District in New York and Navy Pier in Chicago. As founder of Thompson Design Group, a Boston architecture/planning firm, her current projects include the revitalization of Buffalo Bayou, a 10-mile urban waterfront in Houston. Jane and Benjamin Thompson, FAIA, collaborated for two decades on Design Research, the postwar emporium introducing advanced designs from abroad. Her book, Design Research: The Store That Brought Modern Living to American Homes, chronicling the renowned General Store of Good Design, will be published in September. The Design Mind Award recognizes visionary individuals or firms that have affected a shift in design thinking or practice through writing, research and scholarship. The 2010 recipient is Ralph Caplan. For more than 50 years, Caplan has been thinking, writing and speaking about design and has collaborated with designers on exhibitions, films and publications. His work has addressed the design process as encompassing not only products, but the larger context in which they are used. Caplan is the author or editor of several books, including By Design: Why There Are No Locks on the Bathroom Doors in the Hotel Louis XIV and Other Object Lessons and Cracking the Whip: Essays on Design and Its Side Effects. A former editor of I.D. Magazine, Caplan continues to contribute to numerous books and periodicals and lectures across the United States and abroad. He teaches design criticism at the School of Visual Arts in New York. The Corporate and Institutional Achievement Award recognizes a corporation or institution that uses design as a strategic tool of its mission and helps to advance the relationship between design and quality of life. The 2010 Award is presented to the U.S. Green Building Council, a not-for-profit organization committed to a prosperous and sustainable future for the United States and the world through cost-efficient and energy-saving green buildings. Since its founding in 1993, USGBC has developed a variety of programs and services, including the Leadership in Energy and Environmental Design green-building certification program, a process that rates the design, construction and operation of green buildings. Currently, USGBC comprises 80 local affiliates, more than 17,000 member companies and organizations and more than 140,000 LEED Professional Credential holders. Finalists in the Corporate and Institutional Achievement Award category are Design That Matters, a not-for-profit design company that partners with social entrepreneurs to design products that address basic needs in developing countries, and Oxo, whose products combine ergonomic design with a modern aesthetic and ease everyday home tasks for the broadest spectrum of users. The Architecture Design Award, which recognizes work in commercial, public or residential architecture, is given to KieranTimberlake. The Philadelphia-based architecture firm founded in 1984 by Stephen Kieran and James Timberlake is noted for its integration of research with design, guided by a deep environmental ethic. Composed of more than 50 professionals, KieranTimberlake has produced a diverse body of work for arts, civic, educational, government and residential clients, including Cornell University, Sidwell Friends School, University of Pennsylvania, Yale University, the Museum of Modern Art and the Make It Right Foundation. The firm recently won a competition to design the new U.S. Embassy in London. Finalists in the Architecture Design category are Lake|Flato Architects, a Texas-based firm led by principals David Lake and Ted Flato and recognized for architecture that responds to the natural environment and merges with the landscape, and Design Corps, a North Carolina not-for-profit organization led by founder and executive director Bryan Bell with a mission of providing architecture services to those traditionally not served by the field. The Communication Design Award, which honors work in graphic or multimedia design, is presented to Stephen Doyle, creative director at Doyle Partners, a design studio specializing in identity, packaging, signage, environment and editorial design. Doyles unique ability to give words a deeper meaning in graphic form results in an intelligent, provocative body of work for a range of clients including The New York Times, AIGA, Vanity Fair magazine and publisher Alfred A. Knopf. Notable projects include branding, packaging and in-store presentations of Martha Stewart Everyday in Kmart and new identity programs for Barnes & Noble. Doyle previously served as art director at M&Co. and as associate art director at Rolling Stone and Esquire magazines. He has lectured at Yale University, the Cooper Union for the Advancement of Science and Art, the School of Visual Arts and New York University. Finalists in the Communication Design category are John Jay,global executive creative director and partner of the Wieden+Kennedy advertising agency, who is praised for his bold innovation in the advertising field, and Maira Kalman, designer, author and artist, whose illustrations often grace the covers of The New Yorker. Recognizing work in clothing, accessory or footwear design, the Fashion Design Award is presented to Rodarte. Rodarte was founded in Pasadena, Calif., in 2005 by Kate and Laura Mulleavy. Their meticulous and mesmerizing designs meld strong statements of color with unusual fabric treatments and combinations. Border towns, California Condors, Boris Karloff as Frankenstein, and Japanese horror films are among the many influences that make up the world of Rodarte. The Mulleavys were awarded the 2009 Womenswear Designer of the Year by the Council of Fashion Designers of America and Rodarte was the first American fashion house to receive the prestigious Swiss Textiles Award in 2008. Rodarte is in the permanent collections of the Costume Institute of the Metropolitan Museum of Art and the Fashion Institute of Technology Museum and was recently featured in Quicktake: Rodarte, a solo exhibition at Cooper-Hewitt in 2010. Finalists in the Fashion Design category are Behnaz Sarafpour, known for her refreshing and effortless elegance, and Proenza Schouler, offering an edgy, youthful take on upscale dressing by design team Lazaro Hernandez and Jack McCollough. The Interaction Design Award, given for exceptional work using digital technology, is awarded to Lisa Strausfeld, interaction design trailblazer and partner at Pentagram. An expert of information visualization, Strausfelds work lies at the intersection of physical and virtual space. At Pentagram, her team specializes in digital information design projects ranging from software prototypes and websites to interpretive displays and large-scale media installations for a range of civic, cultural and corporate clients. Strausfeld has received numerous awards from the prestigious International Design Excellence Awards, including for her design of Sugar, the graphical user interface for One Laptop per Child. In addition to broad publication of her design work, Strausfeld holds four patents relating to user interfaces and intelligent information search and retrieval. Finalists in the Interaction Design category are Potion, the New York-based design and technology firm commended for its large-scale, social-interactive experiences, and Local Projects, a design studio that combines information design, media and interactivity to tell stories in public spaces, museums and over the Internet. The Interior Design Award, recognizing an individual or firm for exceptional and exemplary work in domestic, corporate or cultural interior design, is awarded to William Sofield. Known for his unique take on modernism, Sofields work lies on the belief that design must live as well as it looks. His holistic approach grounded on craft and materials creates highly original spaces that are compelling and welcoming. He founded Studio Sofield in 1996 as an interdisciplinary design collective, integrating disciplines ranging from landscape design to residential, from retail to corporate office-space design, and from hospitality to furniture design. Sofields projects have included more than 900 retail boutiques around the world for Tom Ford, Bottega Veneta, Yves St. Laurent and Gucci and corporate offices for Soho Grand Hotel in New York. His own furniture collection for Baker was launched in 2001. Sofield lectures across the country and donates design services and strategic support to many not-for-profit organizations, including the Brooklyn Museum, the Whitney Museum of American Art, the Alzheimers Association and AIDS Project Los Angeles. Finalists in the Interior Design category are Clive Wilkinson Architects, a California-based firm that covers the full spectrum of architecture and interior design with added focus on research, lighting, product and graphic design, and Aidlin Darling Design, a multidisciplinary firm that bridges the demands of artistic endeavor, functional pragmatics, environmental responsibility and financial considerations. The recipient of the Landscape Design Award, which is presented for work in urban planning or park and garden design, is James Corner Field Operations. Established in 1998 by James Corner, Field Operations is a leading-edge landscape architecture and urban design practice based in New York City. With the cross-disciplinary backgrounds of many of its 30 professionals, including in landscape architecture, urban design, architecture and communication art, the firm creates high-quality design solutions for cities, landscapes and public spaces. The practice has raised the visibility and efficacy of landscape architecture in shaping and enriching peoples lives, particularly in urban environments and the public realm. Its diverse projects include the design of the High Line in New York, City, the pool decks and gardens of City Center in Las Vegas, Fresh Kills Park in Staten Island, N.Y., Governors Island in New York Harbor, Race Street Pier in Philadelphia, Shelby Farms Park in Memphis, Tenn., and Lake Ontario Park in Toronto. Corner is also professor and chair at the University of Pennsylvania School of Design. Finalists in the Landscape Design category are Andrea Cochran Landscape Architecture, a firm that seamlessly integrates landscape, art and architecture, and Stoss Landscape Urbanism, a Boston-based studio that practices at the juncture of landscape architecture, urban design and planning. Given for work in the design of consumer goods, technology or home and office furnishings, the 2010 Product Design Award is presented to Smart Design, a multidisciplinary design consultancy led by principals Davin Stowell and Tom Dair. Founded in 1980, Smart Design uses insight and innovation to develop and design consumer products that meet peoples needs, answer market demands and solve critical manufacturing challenges. Projects are designed with a focus on connecting with the end user and have included OXO Good Grips kitchen tools, the SmartGauge instrument cluster for the Ford Fusion Hybrid, the New York City taxi graphics, medical devices for UCB Group and Hewlett-Packard Photosmart compact photo printers. Its extensive list of clients includes Cardinal Health, Cisco, Coca-Cola, Johnson & Johnson, Microsoft, Samsung, Toyota and World Kitchen. Finalists in the Product Design category are Continuum, a design and innovation consultancy famous for projects such as the Reebok Pump and the Swiffer for Procter & Gamble, and Frog Design, a global innovation firm that focuses on emerging technology and producing intelligent product and service design.  Peter Hudson, vice president of footwear design, Nike Inc.
Oct. 9-17. In addition to hosting a Teen Design Fair and Winners Panel, the program will reach school teachers and their students nationally, in the classroom and online through Cooper-Hewitts Educator Resource Center (www.educatorresourcecenter.org). The site features more than 300 lesson plans aligned to national and state standards that demonstrate how the design process can enhance the teaching of all subjects and features discussion boards that provide a forum for educators to exchange ideas. The museums website also features the year-round Design Across America clickable map listing design-oriented events throughout the country. The Peoples Design Award, now in its fifth year, invites the public to express their views on what constitutes good design, whether an everyday object, a design classic or an architectural landmark, from Sept. 13 through Oct. 12. By logging on to www.cooperhewitt.org, users can browse and vote from the existing nominees or upload images to nominate a new work. The museum also offers a Peoples Design Award Facebook application, which allows users to share and discuss their favorite designs with friends and broaden the conversation about good design. The winning design will be announced Oct. 14 at the National Design Awards Gala. The chair of the Oct. 14 gala is Richard Meier, and the vice chairs are Deborah and Christopher Buck, Amita Chatterjee, Becky and David Gochman, Alice Gottesman, Ralph Rucci, Nadja Swarovski and Judy Francis Zankel. Paula Zahn will serve as the emcee of the Awards ceremony. Visitors will Observe Conservators Investigating Monet's "Water Lilies"
Cooper-Hewitt to Present "Color Moves: Art and Fashion by Sonia Delaunay"